By the way, Mac, I was skimming Mistborn TFE, and on page 91, we get an explicit mention that lines pointing to small sources are faint. Kelsier turned and walked back up onto the roof’s ledge. Then he jumped off the building. Mist curled in the air around him. He burned steel, second of the basic Allomantic metals. Translucent blue lines sprang into existence around him, visible only to his eyes. Each one led from the center of his chest out to a nearby source of metal. The lines were all relatively faint—a sign that they pointed to metal sources that were small: door hinges, nails, and other bits. Thank you, I will point this out to my friend. Also, Brandon continues to muddy the waters on twitter about sumo wrestler lurchers. @BrandSanderson Would being fat be advantageous for steel pushing? Asking for a friend. "By the way, if all noble-era allomancers got some fight training, does that mean a lot of coinshots and lurchers got really fat, so they had more weight for their pushes? ... I'm now thinking of a scheme where a non-allomancer noble member has to get super fat in a month so his House can bluff that they have more coinshots than they do." "Hah, good question. I don't think that's what happens. After all, many of them hide what they are in order to keep opponents guessing. If it were too obvious, that wouldn't work." With that WoB, I think the way to best reconcile weight's effect upon pushing/pulling is, instead of the effect looking like this , it's actually something more like this . Packing on the pounds gives you more force in absolute terms, but makes you slower to accelerate. Poked Brandon about Ruin creating a Blue Whale Inquisitor. If it could, in fact, destroy ships with a flap of its flipper, but not fly, I think that's as good a confirmation as we'll ever get. The terms you're using are confusing to me. You admit that it's not "you have stronger Pushes if you're fatter" because you're admitting that it's only when you're trying to Push on something like a Coin or like another allomancer, the quote flat-out states that it means if you're trying to jump off an Anchor you don't Push as well. Yet, the terms on your chart still make it seem like you somehow burn steel faster and have more powerful Pushes, unqualified, by being 250 pounds instead of 185. I think it's clear from the books, and from his responses, that an Allomancer has a specific burn rate for their metal; Sazed and Kelsier talk about there being variance between allomancers, but everyone's pretty close to the average. This means a certain amount of force is being added to their Pushes. 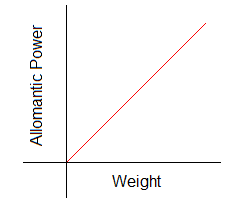 The other thing that seems obvious is, the force is somehow applied in inverse proportion to the relative mass of the bodies (one the allomancer, the other the bit of metal). So if you Push on something very heavy, most of the force goes to you. If you Push on something very light, most of the force goes to the other body. So, if you're 250 and I'm 185 and we're in a Push Contest, the force of our Pushes will hit me more than it hits you. However, you're chasing me, not only am I trying to Push less mass, so I'll go faster than you, but if we're Pushing off the same anchors, I'll be getting more force from my Pushes, because by however little your weight isn't as disproportionate as mine, so I'll be going faster for two reasons. So, a fat coinshot has one advantage, at the expense of another. It really sounds like it's specifically useful exclusively for Push contests, and if your opponent is more mobile, which he or she will by definition be, he or she will prolly be able to dictate whether or not you're in a Push battle. Every Mistborn book we've seen so far has starred someone who uses steel as their primary offensive ability, and in all that time we've seen one classic "Push Battle," and the star lost. And it's unclear what she would have won, anyway. How do you "win" a Push Battle? If one of you isn't anchored, he just flies away. There's no way you're going to be obese enough to Push another Coinshot away unanchored, unless you're Baron Harkonnen. If you're both anchored, than it takes you a couple of minutes and you... crush him to death, I guess? And if he's got one ally around that ally just walks up and stabs you while you're concentrating on this, unable to move, unable to dodge. I'm not sure I'm understanding what you're saying. We know that when you Push or Pull on something allomantically, you get an exact equal and opposite force on yourself. Brandon's even said this is the most fundamental part of the system. Actions and reactions. Kelsier's little explanation here is probably the most fundamental and important thing to realize about Allomancy—indeed, about a lot of my magic systems. Wax changing his speed by shifting his weight midair admittedly makes figuring out how coinshooting interacts with mass feruchemy a little harder to tease out from textual examples, especially since (aside from a single example) he only really notices that it's happening after talking to Khriss. Incidentally, Khriss is talking to Wax because of his unique allomantic+feruchemical combo. She doesn't care about what happens if he's just screwing around with mass (and indeed, she could ask any iron ferring about that), but what happens if he's screwing around with mass while actively allomantically Pushing. The sudden acceleration or deceleration to keep momentum conservation only works out to conserve it in a single rest frame. I suspect that this rest frame is the same one a time bubble would end up anchored to, since having multiple allomantic 'rest frames' for the same location would be silly. Perhaps iron/steel allomancy give you a closer Connection to the location, which screws with momentum when you use the f!iron? That might be the 'chemical' combination of powers Khriss was talking about in the Ars Arcanum. A Deader would probably have the same effect, but I doubt you get that powerset nickname without a distressing tendency for Deaders to end up, well, Dead, so Khriss wouldn't have one available to ask. PhantomMonstrosity wrote: I'm not sure I'm understanding what you're saying. 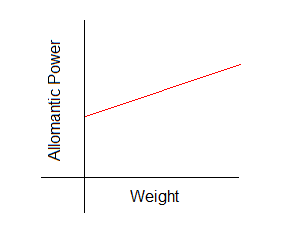 We know that when you Push or Pull on something allomantically, you get an exact equal and opposite force on yourself. That is expressly and definitely not the case. I've heard people say that it's "elastic force" as opposed to "inelastic force." We know that, within reason, you cannot modulate the power of a Push. If what you were saying were true, there'd be no such thing as firing a coin, or needing an anchor to fly. If Connie Coinshot Pushes on a solid anchor, she will going flying. Since she must Push on any two thing at roughly the same force, that would mean that whether she was Pushing on a lamp-post or a coin in the air, she would always fly backwards, if what you're saying is right. There are actions and reactions, and consequences, like Kelsier says, but that doesn't mean the same force is applied to Connie's body regardless of what she's Pushing against. One fact is central. If Connie Pushes on a coin in the air, insufficient force acts upon her body to send her flying. If she Pushes on an anchor, sufficient force acts upon her body to send her flying. Since we know you can only modulate your Pushes to a certain extent, the only possible conclusion is that inequal amounts of force are being applied to her body depending on the mass of what she's Pushing. I can see where the Kelsier quote could make you think he was saying the force on his body is always the same, but in fact he's actually saying the exact opposite. He's saying, you have to always think about what's actually going to happen when you Push, because it won't be the same each time. You have to think about your mass, the mass of the object being Pushed, angles, gravity, anchorage. These all affect things, all variables in a huge equation being played out in time and three dimensional space. PhantomMonstrosity wrote: Wax changing his speed by shifting his weight midair admittedly makes figuring out how coinshooting interacts with mass feruchemy a little harder to tease out from textual examples, especially since (aside from a single example) he only really notices that it's happening after talking to Khriss. One fact is central. If Connie Pushes on a coin in the air, insufficient force acts upon her body to send her flying. If she Pushes on an anchor, sufficient force acts upon her body to send her flying. The maximum force you can use is constrained by the amount of metal you're pushing on, that's well-established. The difference between pushing on a coin and shooting it into the air, versus pushing on a coin and flying off yourself is more in the duration of the push, rather than the strength of it. Push strength falls off with distance, after all. If the coin is already out of range within seconds, you don't experience the force for long enough to get a noticeable change in velocity. It's just like shooting a gun and propelling yourself with recoil - you could totally make a jetpack out of machineguns, provided you didn't have to worry about carrying ammo. Let's say Wax is falling to the ground without pushing on anything, and suddenly increases his mass. If that triggered momentum conservation he'd suddenly slow down. If he decreased his mass, he'd suddenly speed up. Anyone with F!Iron could do the same or similar test. Khriss could easily ask them to start filling or tapping from an ironmind midjog, and watch if their speed suddenly increased or decreased midstride. It really seems like Khriss was primarily interested in what Wax is doing while he's actively using a steelpush. That would also give a Watsonian explanation why Sazed never noticed any of these effects when using his iron feruchemy (rather than the doylist explanation of 'he hadn't thought of it yet'). PhantomMonstrosity wrote: The maximum force you can use is constrained by the amount of metal you're pushing on, that's well-established. Except that it isn't... once that coin hits the ground, the amount of metal in it doesn't change. It's suddenly braced, which changes its effective mass as far as the Push is concerned, and so suddenly more Push is being applied to your body, but hitting cobblestones doesn't magically make it be more metal. Nails and hinges and latches are all perfectly braced, yet they show us as no thicker or brighter lines than a coin in the air. The difference between pushing on a coin and shooting it into the air, versus pushing on a coin and flying off yourself is more in the duration of the push, rather than the strength of it. Many is the time Kelsier or Vin will be falling, drop a coin, and Push on it constantly. Their Push sends it to the ground, but their own fall does not slow. The narration makes it clear, the instant the coin is braced, they instantly experience upwards acceleration. Also, most Pushes don't last that long. It's not as clear, and I thought as you did at first, that people tended to Push until they were out of range, but upon further readings I found subtle indications making it clear that for the most part, you fling yourself into the air like you're being fired out of a cannon, not like you've got rockets. Also, there are innumerable examples of times Coinshots or Mistborn are flung through the air immediately off a coin or a few nails. They don't have to wait several seconds for enough force to build up to send them flying. Vin dropping a coin between herself and Zane during one of their early encounters. Wax in the Alloy prologue when he first notices a bit of metal move, and Pushes off some nails to fling himself away in the bare moment it takes the man to fire. You're ignoring terminal velocity. He's falling as fast as he can fall. He's not falling in a gravity-less vacuum. If he increases his mass, his body would try to slow, but gravity would drag him faster and he'd end up at the same speed. If he decreased his mass, his body would try to speed up, but air resistance would hold him back. Falling doesn't work; it needs to be someone propelled along, or possibly up. Now, granted, this is obviously a retcon. In Alloy, Wax makes specific note that when he's in the building at the end, he Pushes himself up, taps weight in mid-air and Pushes on the ceiling, but that doesn't slow his ascent. It absolutely should. In Shadows and Bands, it becomes clear that Mr. Sanderson changed things so that now, momentum is conserved. The speeds are nowhere near what she'd need for a test of that kind. Wax is faster than a train. When a football player catches a football mid-sprint, his total momentum should change by a noticeable amount, but you can't tell by looking at him because he compensates subconsciously. If a Skimmer were jogging at... what, 2mph? What kind of momentum do they possibly have? Their weight would have to shift enormously for the change to be noticeable. I think you're looking at this whole thing backwards. You act like Khriss has always wanted to know the answer to this one specific question, and that she'd clearly have deduced it by now if she were able, rather than waiting for Wax to be born. But I disagree. I think she found a Twinborn that happened to be reasonably rare, and then thought up several questions that he'd be uniquely qualified to answer. It was a question of opportunity. Could it theoretically be answered by a Skimmer under certain difficult-to-achieve conditions? Sure. Was the matter pressing enough for Khriss to go to that effort? Absolutely not. Even if you were right, which I disagree with, that's not what conservation of momentum is, then. It would be conservation of force, and it's nothing new. Vin knew that. In her Push battle with that Coinshot during Elend's first assassination, she braced herself on the roof. Her greater effective weight meant a more powerful Push was transfered to the Coinshot. No part of that has anything to do with conservation of momentum; in fact, it's momentum changing. One person's speed remains the same while her mass effectively changes, another guy's mass remains the same while his speed drastically changes. Neither of them have the same momentum they began with. I see what you're saying here but I still disagree. If someone said, "fired out of a cannon" that wouldn't mean that the cannon followed you through the air and kept pushing you. "Soaring through the air on a Steelpush", I take to mean, you Pushed yourself once, and now you are soaring through the air. It's natural for us to think of Steelpushes as constant force, because that's how most superhero flight powers work in comic books, but it's not how it works in Mistborn. It's like Superman before the radio program decided he could fly. He used to simply leap from spot to spot. There are rare exceptions, like Wax catching up to the train or Vin on the spikeway, but for the most part, Steeljumps are a single, powerful Push, and then a long bound before the next Push. As for Sazed, while I wish I could agree, we have a WoB (which I will find when I'm not late for work) saying that he simply didn't bother testing very much in the way of feruchemical malatium. He's a scholar, yes, but clearly not a researcher. He studies the works of others and will compile and analyze them, but he's not the sort of person, it seems, who is driven to experiment. Let's say a guy is jogging along at 4 mph and suddenly taps 100% weight, instantly slowing to 2 mph midstride. Would that be noticable? Absolutely. Let me rephrase the test. Let's say we have a 200 pound wax falling at terminal velocity (100 mph). He has a momentum of 20000 lbmph. He suddenly taps weight, and now weighs 1000 pounds. If he needs to stay at 20,000 lbmph, he should now be falling at 20 mph (and will start accelerating again until he reaches terminal velocity - which will be higher, because he's so dense). Similarly, let's say he stores weight instead. If he now weighs 100 pounds, to conserve momentum he now needs to be falling at 200 mph (and will start slowing down from air resistance, until he reaches terminal velocity - which will be lower, because he's got so little density). The change in velocity has to be just as fast as the change in weight, otherwise you end up with his momentum no longer remaining constant. EDIT: Eh, I'll ask Peter if it's a retcon, and see if he responds. Our main point of disagreement seems to be based on whether the Rules of Magic have been fixed the whole time or not, and an official answer one way or the other will settle it. PhantomMonstrosity wrote: Let's say a guy is jogging along at 4 mph and suddenly taps 100% weight, instantly slowing to 2 mph midstride. Would that be noticable? Absolutely. Several things. First, he'd be slower for the length of time it took his next foot to fall, so some tiny fraction of a second. From that point on, he'd be trying to push himself forward off his foot at twice weight, and would feel slower thereby. So, if Khriss asked, "While your body was traveling between footsteps, so maybe two feet, did you feel like the second foot was slower than the first foot?" the person's reply would almost certainly be, "Um. I dunno? Sure? Maybe?" It's as inaccurate as can be. Someone's self-assessment of their speed over a foot in a fraction of a second before they slow for sure for a completely different reason. You ask, would that be noticeable, and then answer yourself, absolutely. I challenge that answer. I think it would absolutely not be noticeable. Second, like I said, there's no reason to suspect this was something she's been dying to answer forever. There doesn't seem to be a pressing need. It wasn't that she had this one question she's been trying to get answered for decades. It's that she just met a person with a unique skillset who has been in a position to conclusively test conservation of momentum, so that's the question she asks. PhantomMonstrosity wrote: He suddenly taps weight, and now weighs 1000 pounds. If he needs to stay at 20,000 lbmph, he should now be falling at 20 mph (and will start accelerating again until he reaches terminal velocity - which will be higher, because he's so dense). That is the literal opposite of what terminal velocity means. It's stated in the book, and it's been been proven in real life that terminal velocity is the same, regardless of mass, weight, or volume. Sazed mentions it in Well, Wax mentions it in Alloy, and it's a physical fact of life. Your terminal velocity does not change if your mass changes in mid-flight. You would stay the same velocity. PhantomMonstrosity wrote: Our main point of disagreement seems to be based on whether the Rules of Magic have been fixed the whole time or not, and an official answer one way or the other will settle it. No... no, I do not think that is our main point of disagreement. I definitely do not think asking him to clarify if it's a retcon or not will solve our debate. I'm certain that it is, because in Alloy he expressly says, "I'm changing my weight but my velocity is remaining totally the same" and then in Shadows he says, "I'm changing my weight and my velocity is therefore changing." Something did, in fact, change there. And if you read the passage, both in Shadows and in Bands, he makes it clear that this isn't the same phenomenon as "he stored his weight and Pushed himself, flinging himself further."